Watch video from the research panel discussion on conceptualizing community, seeking solutions and minding metrics, from ISOJ 2018. The future vision of journalism is looking at new ways in which communities are covered, stories are framed and metrics affect different dynamics of the field. 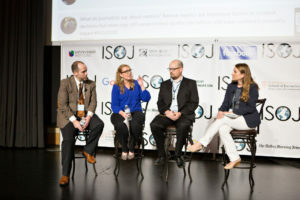 This is according to researchers who presented at the 19th International Symposium on Online Journalism (ISOJ) on Friday, April 13. Summer Harlow, of the University of Houston, started off the event and shared her research done with Monica Chadha of Arizona State University, which looks at the sustainability of community news. Harlow and Chadha’s research, “Looking for Community in Community News: An Examination of Public-spirited Content in Online Local News Sites,” examined not only the financial sustainability of community online news, but rather how online news sites maintain the public spirit in journalism. Harlow discussed the civic engagement criteria of community journalism: advocacy, calls to action, community cheerleading and mobilizing information. Harlow and Chadha’s research looked at revenue and inclusion of public spirited content, ownership and public spirited content, sites’ mission of public spirited content and interactive features. According to Harlow and Chadha’s findings, advertising-reliant sites distance themselves the most by adhering mainly to traditional forms of journalism. On the other hand, non-advertising sites see the community through more of an advocacy lens. Income plays a significant role in public spirited content, Harlow said. Low income-earning sites included more calls to action and advocacy stories than higher earning sites. When differentiating between for-profit sites and nonprofit sites, nonprofit sites contained greater community cheerleading, while the latter relied on mobilizing information. General news online sites showed to be neglecting public spirited content. Harlow said interactive features on community online sites could create more solutions in terms of generating public spirited content. Funding and innovation is a relationship that stands out, facilitating more community engagement, but ultimately it depends on resources for these interactive features, she explained. Lough and McIntyre’s research documented how journalists perceive solutions journalism. They found that solutions journalism complements investigative journalism since it takes off from where investigative journalism ends. “So if investigative journalism is the watchdog, solutions journalism is the guide-dog, it tells you what’s next,” Lough said. The biggest change for reporters when doing solutions journalism is their habit of thought, Lough said. Lough gave the example of one journalist utilizing a story map to figure out how to approach solutions journalism in order to avert reporting exclusively on problems. Ultimately, Lough and McIntyre found that what prevent solutions journalism from happening is management, but at the same time news organizations do exist that facilitated solutions journalism. “If the editor doesn’t believe in a solutions oriented approach, it was really hard for the staff reporter to get out there and do the story,” Lough said. Jeremy Shermak, a doctoral student from UT Austin, closed the presentation looking at an overview of metrics, focusing on the bigger picture of news and how it is monitored by journalists and organizations. Research from Shermak and Kelsey Whipple of UT Austin, looked at “Quality, Quantity and Policy: How Newspaper Journalists Use Digital Metrics to Evaluate Their Roles and Their Papers’ Strategies”. “Circulation numbers quite obviously just don’t do it anymore and we have the ability to get more information from our audience and so we created what we called an ‘Imaginative Audience,’” Shermak said. An Imaginative Audience is what people picture using data and insights such as metrics, Shermak said. Shermak and Whipple examined the “Hierarchy of Influences,” focusing on how news production is altered by various interested parties, such as news organizations, journalists and supervisors, Shermak said. A key theory associated with their work was the Gatekeeping Theory, which looked at the particular channels news go through and how that changes the overall product. Shermak said he and Whipple found valuable information from the 521 journalists they surveyed. Journalists were divided into three categories: online, print and hybrid. The more journalists know about their organization’s digital strategy, the more they will find it successful. Journalists believe metrics play an important role in content decisions. Journalists expressed print is still valued compared to the digital side of the news. There are concerns over profit, even if journalists exceed goals in terms of social media presence and engagement. There is a lack of resources in terms of funding and additional journalists who are specialized in fields such as programming and developing. At the end of the panel, Shermak stated, in the context of his and Whipple’s survey, a conclusion that can ultimately be drawn from the three panelists. Volume 8 of #ISOJ, the official research journal of the conference, is available online. The journal is unique in that it is published simultaneous to the presentation of research at ISOJ. Research included in the journal was chosen from submissions from around the world. Unlike previous years, this volume had the theme “Habits of Thought,” looking at how journalists are changing their practices and mental processes in the face of transformation in the industry. Also for the first time, it was also guest-edited by Jane B. Singer, City University, UK. In addition to the research articles, the journal includes a guest editor’s note by Singer and an invited essay by Joshua Benton of the Nieman Lab at Harvard University. Live streaming is available in English and Spanish at https://isoj.org/. Raw video of Friday’s panels is available on YouTube. To view the morning sessions, click here. To view the afternoon sessions (including the research panel), click here.